Make the most of your speaking engagement at Money20/20 in 2018! Start by letting your social network know you’ll be taking the stage and invite them to join you in Las Vegas. The best way to stand out and get attendees excited about your session is to share teasers of your topic and let them know your session details, such as day, time and location (found on our online agenda). Even better, let them know when and where they can find you after your talk to continue the conversation and schedule meetings! 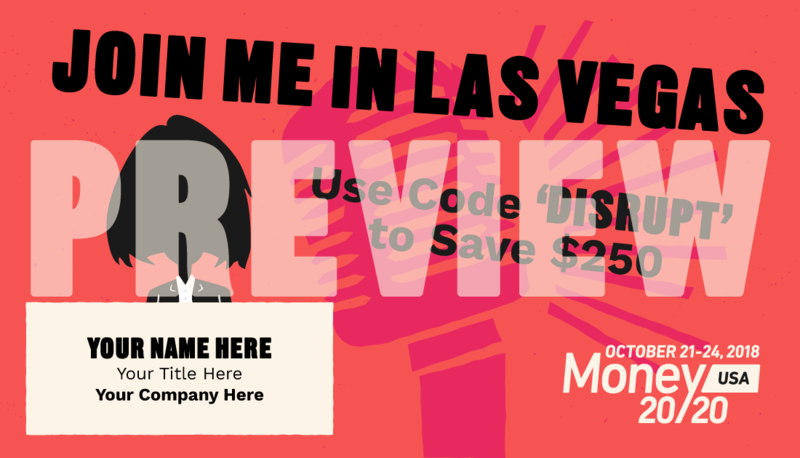 Add an image to your email signature to let those you’re already in contact with know you’ll be speaking at Money20/20 this year (right-click on graphic to save). Click below to post a Tweet and let your Twitter followers know that you’ll be speaking at Money20/20. Let your team get creative with your marketing efforts and include the Money20/20 logo to help promote your presence. Click here to download our logo. Create your personalized image below with your caricature, name and title to share on Social Media. Be sure to tag @Money20/20 and use #Money2020 for a retweet!